Central air conditioning units require regular routine maintenance and inspections of the system to ensure efficient operation. Purchasing magnetic air deflectors may help push air away from windows and up from the floor; this helps cool a room more efficiently. You may wish to cover the condenser unit with a layer of gravel to prevent weeds from growing inside the condensing unit; this also helps prevent the fan from pulling in unwanted dirt and dust. Tuning up an central air conditioner can help reduce your energy costs. Turn off the power to the condenser unit. The condensing unit's switch is located next to the condensing unit, often mounted on the exterior wall of the home in a gray box. Open the box and push the breaker to the "off" position. Cut any shrubbery or grass growing within two feet of the condenser unit with your pruning shears. This prevents any blockage of airflow to the unit. The condensing unit should be elevated two to three inches from the ground on a concrete or plastic pad. This prevents potential water intrusion. Remove the four bolts from the fan cover on top of the condensing unit with your adjustable wrench. Lubricate the fan with SAE 20 non-detergent motor oil, and lubricate any moving parts located on the fan and motor. 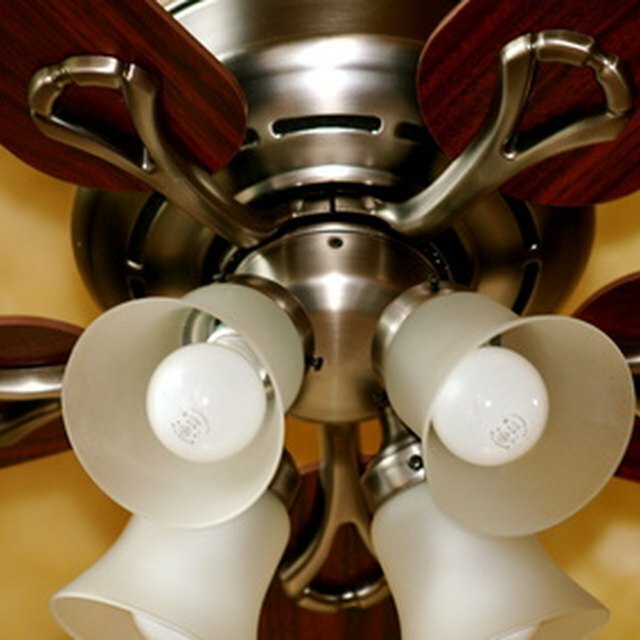 Replace the fan cover and re-tighten the screws. Straighten any bent fins on your central air conditioning condenser unit with your fin-straitening tool. The fins are located on all four sides of your condensing unit. Bent fins prevent proper air flow. Coat the fins of the condenser coil with coil cleaner solution you purchased at your hardware or home improvement store. Allow the cleaner solution to sit on the fins approximately two minutes, and clean the unit with your garden hose. Turn off the power to the blower compartment located inside your furnace. Your home's furnace is located inside your home, typically in a hallway, basement or attic. Vacuum any dust from the blower, inside the unit surrounding the motor, and inside the motor housing. Remove the old filter, and insert a new one inside the furnace door. These should be replaced every month with regular usage of your central air conditioning unit. Turn all power to the central air conditioner back on from the outside of the home at the gray box and in the blower area.